Featuring an elegant cruciform base and understated design, the Bistro Table (2009/2010) by Ronan and Erwan Bouroullec is also suited for outdoor use in the version with a solid core table top. Table tops available in three materials: melamine faced, white surface, smooth straight plastic edge (19 mm); light or dark oak veneer (19 mm); solid core laminate in the colours white, pastel grey or black with black edge (12 mm). 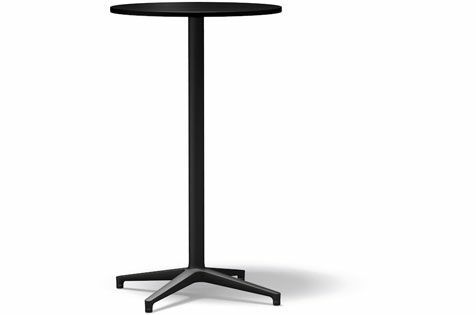 The solid core table top in black has an additional anti-fingerprint coating. Base: powder-coated in basic dark (RAL 9004). Applications: table with top in solid core material is also suited for outdoor use. Pre-galvanised base.